Intellectual rights, as the name suggests, is related to the intelligence of human beings. Intellectual Property (IP) refers to creations of the mind, such as inventions, literary and artistic works, designs, logos, images, crafts used in commerce etc. Patents, copyrights, and trademarks are some of the major channels through which intellectual property is protected. Recognition and/or financial benefit are mostly the main agendas of protecting one’s effort. The aim is to foster an environment where innovation and creativity can flourish beyond boundaries. Sadly enough, IP rights are under a serious wave of threat in today’s time. Individuals, groups and corporate entities often bring cases of intellectual property infringement. 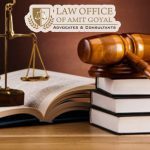 We, At Law Office of Amit Goyal Associates, recognize the fact that it is extremely important to have necessary capabilities, result-oriented strategies, and objectivity when dealing with IP related matters. We, therefore, have a team of most competent and best lawyers for Intellectual Property Rights in Chandigarh. All necessary steps are taken by our best IP Lawyers to help people secure and restrain the unauthorized use of their Intellectual Property.